Neurofeedback is a technology that lets a client observe and ultimately control subtle brain wave activity. This brain wave activity is gathered from comfortable sensors on the client's head and is called an electroencephalogram (EEG). Often the activity is fed-back to the client, via computer, in the form of graphs, sounds, or a video game which moves when the brain waves are appropriate, or stops when they are not. The client learns to regulate his or her own brain states. This technology, originating in universities in the 1960s, has been adapted for effective treatment of a wide variety of conditions (isnr.org). The "Cortexercise" website is dedicated to discussing certain aspects of the neurofeedback phenomena not often discussed elsewhere. If you would like a basic introduction to neurofeedback before continuing, you can visit “A Matter of Mind.” I believe that the effectiveness of neurofeedback is largely dependent upon and/or explainable by the phenomena listed below. Each of these fields has an abundant literature which suggests new ways to implement neurofeedback and self-regulation. I will provide an overview that attempts to synthesize these individual subjects, and then provide additional resources for each of them. Later we will look at neurofeedback protocols, the importance of QEEG (quantitative electroencephalography), and integrative neurofeedback approaches to common conditions such as addiction, anxiety, Alzheimer's disease, attention deficit, autism, bipolar disorder, chronic pain, depression, PTSD (posttraumatic stress disorder), sleep disorders, etc. People come to neurofeedback when they can't sustain change by themselves. Neurofeedback is generally safe and beneficial, but there are conditions in which progress is difficult. Learning, change and growth require neuroplasticity. Neuroplasticity requires certain nutritional and metabolic factors. Neuroprotection is required for this process as well, since brain change requires a modest amount of inflammation, and many individuals and many conditions do not tolerate the inflammation of change. Causes for poor neuroprotection can include nutritional deficiencies, mild genetic tendencies, and neurotoxins (heavy metals, pesticides, molds, etc.). Like all growth and learning, neurofeedback can work most effectively when neuroprotection and neuroplasticity function well. I discuss this in more detail here: Synaptic Recidivism. There are many nutriceuticals that are useful for modulating this effect. A biochemical pathway called the methylation cycle is important for many crucial activities, including neuroprotection, learning, memory, expression of DNA, detoxification, and integrity of the gut. It is often disturbed in humans by environmental toxins, genetic factors, or nutritional imbalances. When methylation is purposefully disturbed in the laboratory, animals can lose their memories and have difficulties learning. Enrichment of the animals' environment can reverse this damage and even restore previously lost memories. Environmental enrichment has a wide variety of other beneficial effects on behavior and well-being. For animals, environmental enrichment usually includes a frequently changing variety of different problems to solve, landscapes, smells, social encounters, and other stimuli. It is like an ever-changing Exploratorium. I regard neurofeedback as an Exploratorium that reads your brain state. By embracing this comparison we get access to hundreds of research studies regarding this process. You will find that environmental enrichment, neuroprotection, and neuroplasticity are important for the understanding and effectiveness of neurofeedback. You can't learn to ride a bicycle by listening to a lecture. Instead it takes practice and a special attitude. To ride a bicycle is to become "aware of the modifications of balance, accompanied by the attitudes of curiosity, openness, acceptance, and appreciation." Curiosity - we must be curious to see if we can get across the lawn before we fall down. Openness - we must be open to the fact that we might fall down. Acceptance - we must accept the fact that we inevitably fall down sometimes. Appreciation - I sure appreciated having that bicycle. To paraphrase Daniel Siegel, mindfulness meditation can be defined as awareness of the modifications of the mind, accompanied by the attitudes of curiosity, openness, acceptance, and appreciation. I find this to be a perfect analogy for the processes of learning self-regulation through neurofeedback and even biofeedback. In clients with habitual insecure attachment, exploring neurofeedback can lead to frustration and a cascade of reactions. However, the learning and coping style of the client who developed with a secure attachment is curious, open, accepting, and appreciative. These are also hallmarks of effective prefrontal executive control. Mindfulness meditation studies are proliferating. Because of the similarity of those process to the neurofeedback process, there is a vast potential for cross-fertilization. Early neurofeedback developed in universities in the 1960s. The first clinical applications (epilepsy, attention deficit, head trauma, etc. ), often involved training brain wave amplitudes under a single exploratory electrode (with the reference electrode on the ear.) Later, the reference electrode was brought to the scalp as well, and it was found that this setup could train two areas of the brain to operate more independently of one another. At the same time, new techniques of analysis were applied to 19 channel EEGs and QEEG (quantitative electroencephalography) was developed. The QEEG analysis enabled clinician's to look at amplitudes and communications among the 19 sites, and to compare the findings with databases collected from symptom-free subjects. Over the last 15 years many studies employing functional magnetic resonance imaging (fMRI) identified many functional connections in the brain that were characterized by synchronous low frequency fluctuations either at rest or during a specific task. Three of those networks that are important to our discussion are 1) the default mode network (DMN), 2) the central executive network (CEN), and 3) the saliency network (SN) that governs network switching. Recently it has been recognized that these infra-low frequency fMRI network connections (0.01-0.10 Hz) are related to the slow cortical potentials of EEG. And in fact such infra-low frequency oscillations have been trained successfully with great benefit to the client by such neurofeedback pioneers as Birmbauer in the Netherlands and the Othmers in the US. It is now known that the higher frequency EEG, such as theta, alpha, beta, gamma, are all synchronously nested into one another and ultimately into these infra-slow potentials like the Russian dolls inside of dolls. Synchronous timing of all these frequencies is important for valid perception. Even more significant may be the fact that the correct functioning of these three networks (DMN, CEN, SN) are important for the growth, development and repair of other cortical connections and cognitive functions. They are known to be dysregulated in most of the major disorders treated by neurofeedback, and, indeed, by the most common disorders that plague our communities. A new approach to neurofeedback, yet to be investigated adequately, would be to attempt to train the connectivity of these default networks in order to continue the development of integrated top-down (executive) and bottom-up (stimulus driven) functioning. Such techniques might include long-distance anterior to posterior training of alpha, theta and gamma synchrony (see below). Technical note: The ability of the brain to shift, lock, and reset the relative phases of its oscillations is key to attention, perception, memory, and top-down executive functioning. The phenomenon of the 'phase reset' can be observed during neurofeedback sessions. I started investigating these ideas two years ago when I somehow developed the belief that standard-alpha theta training needed to evolve to include an electrode placement at the anterior cortex, at Fz in particular, and at Pz. I needed to understand the possible implications of reinforcing anterior theta. I became aware of the existence of healthy synchronized frontal midline theta. This was not to be confused with disorganized polymorphic theta seen in drowsiness, intoxication and encephalopathy. Here are some related abstracts. As I studied Fz (anterior cingulate) and Pz (pre-cuneous) I learned they were the anterior and posterior hubs, respectively, of the default mode network (DMN). The DMN is most active when we are not involved in a resource-intensive task. The DMN is responsible for 1) theory of mind, 2) evaluation of future scenarios, and 3) converting felt implicit memories into declarative auto- biographical memories. The DMN switches out to a central executive network (CEN) through the control of a "salience network" (SN) involving the anterior cingulate and the insula. DMN switching has been shown to be disturbed in Alzheimer's disease, anxiety, autism, bipolar disorder, chronic pain, depression, OCD, Parkinson's disease, PTSD, & schizophrenia. The published BOLD fMRI literature indicates that the DMN has a resonant frequency of 0.013 Hz. Recently Marcus Raichle showed that the BOLD fMRI phenomena, slow cortical potentials, and infra-slow EEG all dealt with the same system. This low frequency system is important for neuroprotection, neuroplasticity, and state change. Nested within these slow cortical potentials are the usual neurofeedback clinical bands. Theta, alpha, and gamma long distance synchrony have recently been shown to be the foundations of attention, perception, memory, cognition, and consciousness. This was getting interesting! Very briefly, the research indicates that sensory binding (e.g., texture, contour, contrast, movement, etc) requires gamma synchronization. The various sensory modes then need to be bound in the heteromodal association cortex (temporal-parietal) through beta synchronization. This heteromodal 'percept' now must be compared to frontal executive goals and expectations which are bound with parietal association cortex (memory) through theta synchronization. The final unitary 'aha' experience involves broad-band (alpha, theta, beta, gamma) synchrony between the anterior and posterior cortex. This is usually accompanied by something called a "phase-reset". The phase reset can easily be seen during neurofeedback if the correct screen instrument is chosen. Usually its appearance is immediately followed by the client saying something like, "Oh!.... now I know why I hate yellow..." Even when watching a remote session accompanied by a conference call, if someone says something that suddenly brings insight to the client, you can see the phase reset. It looks like this: First there is a sudden exactly simultaneous increase of alpha and theta by a factor of 150- 200% and lasting about 200 ms (1 theta cycle). This is followed by about 200 ms (another theta cycle) of semi-synchronous beta activity, followed usually by a brief burst of gamma synchrony. Varela et al (2001) points out that only when alpha and theta are synchronized can the voltage troughs of theta serve as containers for gamma in the service of 'valid perception.' The role of phase is so tightly controlled that a mere phase shift of one gamma cycle can completely interfere with the establishment of long term synaptic potentiation and memory. To understand the importance of phase reset and lock, I have a simple analogy. Suppose you are surrounded by neighbors but separated from them by a seven foot tall sound-proof fence. The only way you can communicate with one of them is if you both jump up at the same time, in phase, so that you can see each other and communicate. For neurons, the in phase jumping occurs at about 5 Hz (theta) and the communication (data binding) takes place at 40 Hz. Imagine that you have just jumped up again and communicated with one neighbor for 1 cycle. On the way back down, you suddenly see many other neighbors' heads starting to appear above their fences. You suddenly grab the wall with your hands and feet, before hitting ground, and reset your phase to that of your other neighbors. This is called a phase-reset. Your previous neighbor is now out of phase with you, but probably in phase with other neighbors in his vicinity. For EEG biofeedback the analogy is even more interesting when we imagaine that everyone's head is electrically negatively charged. When the entire community is jumping up and down at random, the scalp EEG appears desynchronized. When a significant event happens for consciousness, such as an insight, a phase reset occurs, and the negatively charged heads all jump up and down in phase and we see the characteristic synchrony. The sudden phase locking of multiple oscillators causes a brief surge in alpha and theta amplitude that can be easily detected during neurofeedback. For anterior to posterior alpha-theta synchrony training the phase reset is the characteristic marker. This is unlike posterior alpha-theta amplitude training where the alpha-theta crossover is thought to be significant. In fact, it is only an indicator of drowsiness or hypnagogic state. Here are some interesting abstracts on phase resets. As a final comment on a network dynamic of importance to neurofeedback, I would like to mention that the default mode network (DMN) preferentially involves the fast, color-blind, peripheral vision via the ancient magnocellular pathway to the lateral geniculate of the thalamus. The central executive network (CEN) preferentially involves the slow, detailed, central foveal portion of the retina and its parvocelluarl pathway to the thalamus. The magnocellular pathway is known to be disturbed in a number of disorders, especially schizophrenia. During eyes open training (preferred) it may be necessary to isolate and target one visual pathway in order to affect the appropriate network. Introduction to Neurofeedback Protocols It appears that no matter what turmoil an individual might experience, whether child or adult, the brain is hardwired to watch for its own ability to influence the environment in new ways. Neurofeedback (NFB) provides a mechanism for the brain to adjust itself to a new class of external changes - those that mirror the changes of the brain itself. With the resultant rapid development of new neural pathways, self-regulation becomes more robust and better established. For over 40 years neurofeedback has provided a variety of approaches for a variety of problems. These are sometimes called "neurofeedback protocols". In general, a neurofeedback protocol is an approach to evaluating a client and providing a solution. There are some protocols that seem to be suited to most people who are reasonably balanced and want to improve their self- control and creativity. SMR (Sensorimotor Rhythm Training) is one such protocol. Alpha-Theta training for creativity is another. When clients have more troublesome issues there are other approaches. Often these are based on reading the client's EEG (electroencephalogram - brain wave recording) and looking for special markers (phenotypes); or they may be based on running the EEG data through a computerized analysis called QEEG (quantitative electroencephalography). There are a few systems of NFB training developed through decades of ongoing experience that avoid the expensive QEEG when possible and adjust the protocol to meet the clients' needs and responses, e.g., the Othmer infra-low frequency technique. There are some middle paths that offer quantitative analysis using less than the full 19 channel (electrode) standard QEEG. The systems of Peter van Deusen and Paul Swingle are examples. There are many other approaches. In addition to 1) standard protocols, 2) EEG phenotypes, and 3) QEEG guided NFB, I believe it is possible to develop a 4th approach based on newly discovered mechanisms of brain function, namely, default networks and cortical synchronization. For the time being I want to discuss a new protocol which I call Theta-Alpha-Gamma (TAG) Synchrony. I find it generally well- tolerated and believe that it may become widely applicable and effective. How this neurofeedback protocol is implemented: This is a two step protocol: 1) first theta-alpha synchrony must be established, then 2) theta-gamma synchrony is trained. There have been many variations on alpha-theta protocols, most of them with the electrode(s) in the occipital or parietal areas (all on the posterior head). In these standard alpha-theta protocols the clinician rewards for increased theta and alpha amplitude individually. In contrast, in 2-channel alpha-theta synchrony, one electrode is at Fz or Fpz (referenced to the left ear) and the other is at Pz or Oz (referenced to the right ear). One thus trains synchrony between the front network hub (Fz) and the rear network hub (Pz). Both the alpha and the theta at the two sites are encouraged to increase amplitude and to move toward synchrony (by using a summed montage). This is distinct from standard alpha-theta training which only rewards amplitude at the posterior of the cortex. Later in training the electrodes are placed lateral to the midline, or, occasionally, they cross it. Standard alpha-theta amplitude training has at most two bands which are inhibited: a high band is inhibited to discourage tension, muscle artifact, or excess beta, and a low (delta) band may be inhibited to discourage drowsiness. In Theta-Alpha-Gamma (TAG) Synchrony training, the use of multiple inhibit bins is mandatory, 6 or more per channel. Auto- thresholding is not used. This is because it is necessary to control small rogue excursions in narrow bands of beta which may represent "beta spindling". Such spindling is common, e.g., in adults with ADHD and in children with autism spectrum disorder. Failure to control for spindling, regardless of the protocol used, can lead to clinical failure or development of tremors. Screen design: In the figure below please look at the bottom half of the screen shot. On the bottom right, approximately 1/3 of the screen shows the raw EEG display for the posterior electrode (usually Pz or Oz) and below the EEG are 6 inhibit bins for controlling rogue excursions and spindling. In the bottom middle 1/3 are the raw EEG display for the anterior electrode, usually Fz or Fpz, and below it are its 6 inhibit bins. On the lower left are two green reward instruments, one for theta and one for alpha or gamma. Immediately to their left are a column of instruments with peripheral measures such as GSR, temp, pulse, respiration. Above them are 2 displays for heart rate variability. On the upper right 2/3 screen you will see a display showing the moment-by-moment amplitudes of theta and alpha (or gamma), and below it, the largest instrument, the cascading display that shows frequency on the horizontal axis and amplitude on the vertical axis. It is showing the sum of the anterior and posterior channels. The screen can be easily set so that a video or DVD on a second monitor plays only when theta and alpha (or gamma) are above a certain threshold and only when no inhibit bins have their thresholds exceeded. Unlike standard alpha-theta training, Theta-Alpha-Gamma (TAG) Synchrony frequently trains with eyes open. This is particularly useful for training children on the autism spectrum. 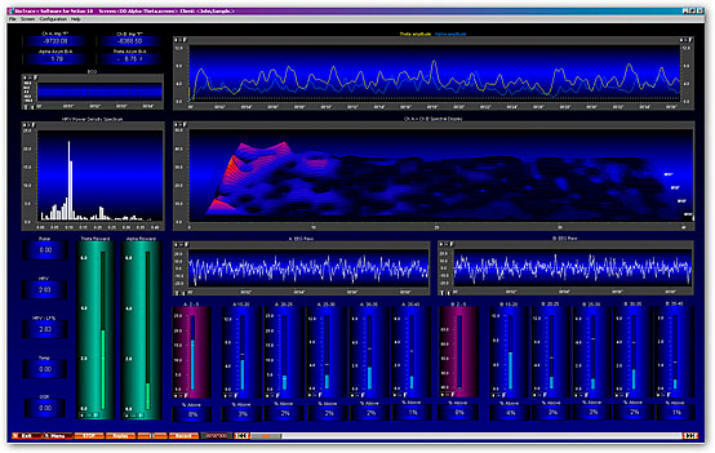 Alternatively, the reward instruments can be set to control the volume of audio. I like to have clients bring mp3 files of music they listen to often. When the theta goes up (the green instrument on the left) the volume of the music goes up. When the alpha (or gamma) goes up (the green instrument on the right) the volume of pink noise goes down. Pink noise sounds like rain. It is simple to ask the client to observe when their music goes up and plays with less noise. "Loud and clear" is a discrete reward for which the clients listen. Two years ago I was wondering how to interpret a QEEG for a client who was taking clonazepam. The effects of clonazepam on the EEG can be quite unpredictable and thus, I reasoned, the QEEG unreliable. I wanted to find some neurofeedback protocol that I could be relatively certain would strengthen normal mechanisms without significant likelihood of harm, even if those mechanisms might currently be distorted by drugs or illness. I was also ready to involve the frontal cortex in alpha-theta training (see below). This is not the place for a detailed description of how I came to certain conclusions. But I will state these conclusions and provide a bit of supportive literature. Later there is a set of citations which may answer some questions. Long distance (anterior to posterior) synchrony of theta, alpha, beta, and gamma frequencies is a "hallmark of consciousness" and is necessary for attention, valid perception, cognitive processing, memory, and affective control. It can be trained through neurofeedback. It is generally well tolerated and may be beneficial with most clients and most conditions. It should be used with caution in known or suspected cases of beta spindling. This protocol may be only of supplementary importance if there is focal damage due to trauma, hypoxia, or defect (developmental, metabolic, or genetic, including strong asymmetries). These are bold assertions. I will provide a small amount of suggestive support from the literature. I leave it to the reader to investigate these concepts more fully, if desired, using the citations below. "...the suggestion that theta/alpha or theta/alpha/beta synchrony is global while gamma or beta/gamma-synchrony is local has already been negated by numerous reports of long-range gamma synchrony coinciding with various conscious experiences." "...long-range phase synchrony really is a hallmark of consciousness... Our results confirm this prediction, and suggest that consciousness may involve not only gamma frequencies, but the whole range from theta to epsilon." Pockett S, Freeman WJ, et al (2009) - EEG synchrony during a perceptual-cognitive task - widespread phase synchrony at all frequencies. Clinical Neurophysiology 120 (2009) 695–708. "...connecting of farther distant prefrontal and posterior association cortex regions seems to be required for positive emotional experience." Aftanas LI, et al (2001) - Human anterior and frontal midline theta and low alpha reflect emotionally positive state and internalized attention - High-resolution EEG investigation of meditation. Neuroscience Letters 2010 (2001) 57-60. "...the degree of long-range synchrony was significantly reduced for both pathological groups as compared with the control group. ...Synchrony is a basic mechanism for neuronal information processing, for short and long distant neuronal communication, for feature binding, and for perceptual and cognitive validity." Bhattacharya J (2001) - Reduced degree of long-range phase synchrony in pathological human brain. Acta Neurobiol. Exp. 2001, 61: 309- 318. "Only coherently oscillating neuronal groups can interact effectively, because their communication windows for input and for output are open at the same times. Thus, a flexible pattern of coherence defines a flexible communication structure, which subserves our cognitive flexibility." Fries P (2005) - A mechanism for cognitive dynamics - Neuronal communication through neuronal coherence. Trends in Cognitive Sciences Vol.9 No.10 October 2005. Two years ago I became concerned that standard alpha-theta protocols did not address direct connection with the executive system. This led me to consider A-T training using Fz-A1 / Pz-A2, rather than the standard posterior montages. At first I wondered about the significance of training frontal theta. As I studied I learned the difference between functional rhythmic frontal midline theta (the Ciganek rhythm) and polymorphic theta. This eventually led to studies of communications between the anterior hub of the default mode network and the posterior hub. Recently it has become evident that the infra-slow frequencies (0.01-0.10 Hz) of slow cortical potential and BOLD fMRI are responsible for neuroprotection, neuroplasticity and state change, while the nested higher frequencies (theta, alpha, gamma) are necessary for the binding of perception, cognition and consciousness. Selected references: 1] Sarnthein J, et al (1998) - Synchronization between prefrontal and posterior association cortex during human working memory. Proc. Natl. Acad. Sci. USA Vol. 95, pp. 7092–7096, June 1998. Abstract / Free Full Text. Singer W (1999) - Neuronal synchrony - A versatile code for the definition of relations. Neuron, Vol. 24, 49–65, September, 1999. Abstract  von Stein A, et al (2000) - Different frequencies for different scales of cortical integration - From local gamma to long range alpha-theta synchronization. International Journal of Psychophysiology 38 (2000) 301-313. Abstract  Varela F, et al (2001) - The brainweb - Phase synchronization and large-scale integration. Nature Review Neuroscience, Vol 2, April 2001, p 229-239. Abstract  Bhattacharya J (2001) - Reduced degree of long-range phase synchrony in pathological human brain. Acta Neurobiol. Exp. 2001, 61: 309-318. Abstract  Schack B, et al (2002) - Phase-coupling of theta–gamma EEG rhythms during short-term memory processing. International Journal of Psychophysiology 44 (2002) 143-163. Abstract  Schack B, et al (2005) - Phase synchronization between theta and upper alpha oscillations in a working memory task, International Journal of Psychophysiology 57 (2005) 105–114. Abstract  Canolty RT, et al (2006) - High gamma power is phase-locked to theta oscillations in human neocortex, Science, 15 September 2006 Vol 313. Abstract / Free Full Text. van den Heuvel M, et al (2008) - Microstructural organization of the cingulum tract and the level of default mode functional connectivity. The Journal of Neuroscience, October 22, 2008; 28(43):10844–10851. Abstract / Free Full Text. Pockett S, et al (2009) - EEG synchrony during a perceptual-cognitive task - widespread phase synchrony at all frequencies. Clinical Neurophysiology 120 (2009) 695–708. Abstract  van den Heuvel MP, et al (2009) - Functionally linked resting-state networks reflect the underlying structural connectivity architecture of the human brain. Human Brain Mapping 30:3127–3141 (2009). Abstract . A biochemical pathway called the methylation cycle is important for many crucial activities, including neuroprotection, learning, memory, expression of DNA, detoxification, and integrity of the gut. It is often disturbed in humans by environmental toxins, genetic factors, or nutritional imbalances. When methylation is purposefully disturbed in the laboratory, animals can lose their memories and have difficulties learning. Enrichment of the animals' environment can reverse this damage and even restore previously lost memories. Environmental enrichment has a wide variety of other beneficial effects on behavior and well-being. For animals, environmental enrichment usually includes a frequently changing variety of different problems to solve, landscapes, smells, social encounters, and other stimuli. It is like an ever- changing Exploratorium. I regard neurofeedback as an Exploratorium that reads your brain state. By embracing this comparison we get access to hundreds of research studies regarding this process. You will find that environmental enrichment, neuroprotection, and neuroplasticity are important for the understanding and effectiveness of neurofeedback. You can't learn to ride a bicycle by listening to a lecture. Instead it takes practice and a special attitude. To ride a bicycle is to become "aware of the modifications of balance, accompanied by the attitudes of curiosity, openness, acceptance, and appreciation." Curiosity - we must be curious to see if we can get across the lawn before we fall down. Openness - we must be open to the fact that we might fall down. Acceptance - we must accept the fact that we inevitably fall down sometimes. Appreciation - I sure appreciated having that bicycle. To paraphrase Daniel Siegel, mindfulness meditation can be defined as awareness of the modifications of the mind, accompanied by the attitudes of curiosity, openness, acceptance, and appreciation. I find this to be a perfect analogy for the processes of learning self-regulation through neurofeedback and even biofeedback. In clients with habitual insecure attachment, exploring neurofeedback can lead to frustration and a cascade of reactions. However, the learning and coping style of the client who developed with a secure attachment is curious, open, accepting, and appreciative. These are also hallmarks of effective prefrontal executive control. Mindfulness meditation studies are proliferating. Because of the similarity of those process to the neurofeedback process, there is a vast potential for cross- fertilization. Early neurofeedback developed in universities in the 1960s. The first clinical applications (epilepsy, attention deficit, head trauma, etc. ), often involved training brain wave amplitudes under a single exploratory electrode (with the reference electrode on the ear.) Later, the reference electrode was brought to the scalp as well, and it was found that this setup could train two areas of the brain to operate more independently of one another. At the same time, new techniques of analysis were applied to 19 channel EEGs and QEEG (quantitative electroencephalography) was developed. The QEEG analysis enabled clinician's to look at amplitudes and communications among the 19 sites, and to compare the findings with databases collected from symptom-free subjects. Over the last 15 years many studies employing functional magnetic resonance imaging (fMRI) identified many functional connections in the brain that were characterized by synchronous low frequency fluctuations either at rest or during a specific task. Three of those networks that are important to our discussion are 1) the default mode network (DMN), 2) the central executive network (CEN), and 3) the saliency network (SN) that governs network switching. Recently it has been recognized that these infra-low frequency fMRI network connections (0.01-0.10 Hz) are related to the slow cortical potentials of EEG. And in fact such infra-low frequency oscillations have been trained successfully with great benefit to the client by such neurofeedback pioneers as Birmbauer in the Netherlands and the Othmers in the US. It is now known that the higher frequency EEG, such as theta, alpha, beta, gamma, are all synchronously nested into one another and ultimately into these infra-slow potentials like the Russian dolls inside of dolls. Synchronous timing of all these frequencies is important for valid perception. Even more significant may be the fact that the correct functioning of these three networks (DMN, CEN, SN) are important for the growth, development and repair of other cortical connections and cognitive functions. They are known to be dysregulated in most of the major disorders treated by neurofeedback, and, indeed, by the most common disorders that plague our communities. A new approach to neurofeedback, yet to be investigated adequately, would be to attempt to train the connectivity of these default networks in order to continue the development of integrated top-down (executive) and bottom-up (stimulus driven) functioning. Such techniques might include long-distance anterior to posterior training of alpha, theta and gamma synchrony (see below). Technical note: The ability of the brain to shift, lock, and reset the relative phases of its oscillations is key to attention, perception, memory, and top-down executive functioning. The phenomenon of the 'phase reset' can be observed during neurofeedback sessions. I started investigating these ideas two years ago when I somehow developed the belief that standard-alpha theta training needed to evolve to include an electrode placement at the anterior cortex, at Fz in particular, and at Pz. I needed to understand the possible implications of reinforcing anterior theta. I became aware of the existence of healthy synchronized frontal midline theta. This was not to be confused with disorganized polymorphic theta seen in drowsiness, intoxication and encephalopathy. Here are some related abstracts. As I studied Fz (anterior cingulate) and Pz (pre-cuneous) I learned they were the anterior and posterior hubs, respectively, of the default mode network (DMN). The DMN is most active when we are not involved in a resource- intensive task. The DMN is responsible for 1) theory of mind, 2) evaluation of future scenarios, and 3) converting felt implicit memories into declarative auto- biographical memories. The DMN switches out to a central executive network (CEN) through the control of a "salience network" (SN) involving the anterior cingulate and the insula. DMN switching has been shown to be disturbed in Alzheimer's disease, anxiety, autism, bipolar disorder, chronic pain, depression, OCD, Parkinson's disease, PTSD, & schizophrenia. The published BOLD fMRI literature indicates that the DMN has a resonant frequency of 0.013 Hz. Recently Marcus Raichle showed that the BOLD fMRI phenomena, slow cortical potentials, and infra-slow EEG all dealt with the same system. This low frequency system is important for neuroprotection, neuroplasticity, and state change. Nested within these slow cortical potentials are the usual neurofeedback clinical bands. Theta, alpha, and gamma long distance synchrony have recently been shown to be the foundations of attention, perception, memory, cognition, and consciousness. This was getting interesting! Very briefly, the research indicates that sensory binding (e.g., texture, contour, contrast, movement, etc) requires gamma synchronization. The various sensory modes then need to be bound in the heteromodal association cortex (temporal- parietal) through beta synchronization. This heteromodal 'percept' now must be compared to frontal executive goals and expectations which are bound with parietal association cortex (memory) through theta synchronization. The final unitary 'aha' experience involves broad-band (alpha, theta, beta, gamma) synchrony between the anterior and posterior cortex. This is usually accompanied by something called a "phase-reset". The phase reset can easily be seen during neurofeedback if the correct screen instrument is chosen. Usually its appearance is immediately followed by the client saying something like, "Oh!.... now I know why I hate yellow..." Even when watching a remote session accompanied by a conference call, if someone says something that suddenly brings insight to the client, you can see the phase reset. It looks like this: First there is a sudden exactly simultaneous increase of alpha and theta by a factor of 150-200% and lasting about 200 ms (1 theta cycle). This is followed by about 200 ms (another theta cycle) of semi- synchronous beta activity, followed usually by a brief burst of gamma synchrony. Varela et al (2001) points out that only when alpha and theta are synchronized can the voltage troughs of theta serve as containers for gamma in the service of 'valid perception.' The role of phase is so tightly controlled that a mere phase shift of one gamma cycle can completely interfere with the establishment of long term synaptic potentiation and memory. To understand the importance of phase reset and lock, I have a simple analogy. Suppose you are surrounded by neighbors but separated from them by a seven foot tall sound-proof fence. The only way you can communicate with one of them is if you both jump up at the same time, in phase, so that you can see each other and communicate. For neurons, the in phase jumping occurs at about 5 Hz (theta) and the communication (data binding) takes place at 40 Hz. Imagine that you have just jumped up again and communicated with one neighbor for 1 cycle. On the way back down, you suddenly see many other neighbors' heads starting to appear above their fences. You suddenly grab the wall with your hands and feet, before hitting ground, and reset your phase to that of your other neighbors. This is called a phase-reset. Your previous neighbor is now out of phase with you, but probably in phase with other neighbors in his vicinity. For EEG biofeedback the analogy is even more interesting when we imagaine that everyone's head is electrically negatively charged. When the entire community is jumping up and down at random, the scalp EEG appears desynchronized. When a significant event happens for consciousness, such as an insight, a phase reset occurs, and the negatively charged heads all jump up and down in phase and we see the characteristic synchrony. The sudden phase locking of multiple oscillators causes a brief surge in alpha and theta amplitude that can be easily detected during neurofeedback. For anterior to posterior alpha-theta synchrony training the phase reset is the characteristic marker. This is unlike posterior alpha-theta amplitude training where the alpha-theta crossover is thought to be significant. In fact, it is only an indicator of drowsiness or hypnagogic state. Here are some interesting abstracts on phase resets. As a final comment on a network dynamic of importance to neurofeedback, I would like to mention that the default mode network (DMN) preferentially involves the fast, color-blind, peripheral vision via the ancient magnocellular pathway to the lateral geniculate of the thalamus. The central executive network (CEN) preferentially involves the slow, detailed, central foveal portion of the retina and its parvocelluarl pathway to the thalamus. The magnocellular pathway is known to be disturbed in a number of disorders, especially schizophrenia. During eyes open training (preferred) it may be necessary to isolate and target one visual pathway in order to affect the appropriate network. Introduction to Neurofeedback Protocols It appears that no matter what turmoil an individual might experience, whether child or adult, the brain is hardwired to watch for its own ability to influence the environment in new ways. Neurofeedback (NFB) provides a mechanism for the brain to adjust itself to a new class of external changes - those that mirror the changes of the brain itself. With the resultant rapid development of new neural pathways, self-regulation becomes more robust and better established. For over 40 years neurofeedback has provided a variety of approaches for a variety of problems. These are sometimes called "neurofeedback protocols". In general, a neurofeedback protocol is an approach to evaluating a client and providing a solution. There are some protocols that seem to be suited to most people who are reasonably balanced and want to improve their self-control and creativity. SMR (Sensorimotor Rhythm Training) is one such protocol. Alpha-Theta training for creativity is another. When clients have more troublesome issues there are other approaches. Often these are based on reading the client's EEG (electroencephalogram - brain wave recording) and looking for special markers (phenotypes); or they may be based on running the EEG data through a computerized analysis called QEEG (quantitative electroencephalography). There are a few systems of NFB training developed through decades of ongoing experience that avoid the expensive QEEG when possible and adjust the protocol to meet the clients' needs and responses, e.g., the Othmer infra-low frequency technique. There are some middle paths that offer quantitative analysis using less than the full 19 channel (electrode) standard QEEG. The systems of Peter van Deusen and Paul Swingle are examples. There are many other approaches. In addition to 1) standard protocols, 2) EEG phenotypes, and 3) QEEG guided NFB, I believe it is possible to develop a 4th approach based on newly discovered mechanisms of brain function, namely, default networks and cortical synchronization. For the time being I want to discuss a new protocol which I call Theta-Alpha- Gamma (TAG) Synchrony. I find it generally well-tolerated and believe that it may become widely applicable and effective. How this neurofeedback protocol is implemented: This is a two step protocol: 1) first theta-alpha synchrony must be established, then 2) theta-gamma synchrony is trained. There have been many variations on alpha-theta protocols, most of them with the electrode(s) in the occipital or parietal areas (all on the posterior head). In these standard alpha-theta protocols the clinician rewards for increased theta and alpha amplitude individually. In contrast, in 2-channel alpha-theta synchrony, one electrode is at Fz or Fpz (referenced to the left ear) and the other is at Pz or Oz (referenced to the right ear). One thus trains synchrony between the front network hub (Fz) and the rear network hub (Pz). Both the alpha and the theta at the two sites are encouraged to increase amplitude and to move toward synchrony (by using a summed montage). This is distinct from standard alpha-theta training which only rewards amplitude at the posterior of the cortex. Later in training the electrodes are placed lateral to the midline, or, occasionally, they cross it. Standard alpha-theta amplitude training has at most two bands which are inhibited: a high band is inhibited to discourage tension, muscle artifact, or excess beta, and a low (delta) band may be inhibited to discourage drowsiness. In Theta-Alpha-Gamma (TAG) Synchrony training, the use of multiple inhibit bins is mandatory, 6 or more per channel. Auto-thresholding is not used. This is because it is necessary to control small rogue excursions in narrow bands of beta which may represent "beta spindling". Such spindling is common, e.g., in adults with ADHD and in children with autism spectrum disorder. Failure to control for spindling, regardless of the protocol used, can lead to clinical failure or development of tremors. Screen design: In the figure below please look at the bottom half of the screen shot. On the bottom right, approximately 1/3 of the screen shows the raw EEG display for the posterior electrode (usually Pz or Oz) and below the EEG are 6 inhibit bins for controlling rogue excursions and spindling. In the bottom middle 1/3 are the raw EEG display for the anterior electrode, usually Fz or Fpz, and below it are its 6 inhibit bins. On the lower left are two green reward instruments, one for theta and one for alpha or gamma. Immediately to their left are a column of instruments with peripheral measures such as GSR, temp, pulse, respiration. Above them are 2 displays for heart rate variability. On the upper right 2/3 screen you will see a display showing the moment-by-moment amplitudes of theta and alpha (or gamma), and below it, the largest instrument, the cascading display that shows frequency on the horizontal axis and amplitude on the vertical axis. It is showing the sum of the anterior and posterior channels. The screen can be easily set so that a video or DVD on a second monitor plays only when theta and alpha (or gamma) are above a certain threshold and only when no inhibit bins have their thresholds exceeded. Unlike standard alpha- theta training, Theta-Alpha-Gamma (TAG) Synchrony frequently trains with eyes open. This is particularly useful for training children on the autism spectrum. 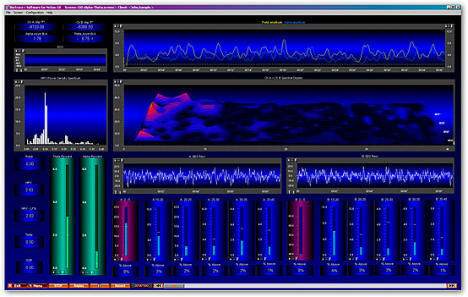 Alternatively, the reward instruments can be set to control the volume of audio. I like to have clients bring mp3 files of music they listen to often. When the theta goes up (the green instrument on the left) the volume of the music goes up. When the alpha (or gamma) goes up (the green instrument on the right) the volume of pink noise goes down. Pink noise sounds like rain. It is simple to ask the client to observe when their music goes up and plays with less noise. "Loud and clear" is a discrete reward for which the clients listen.